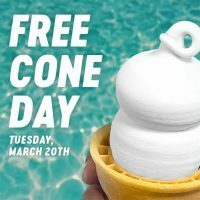 Dairy Queen is offering a free soft serve ice cream cone today (3/20/18) only! This freebie is available at participating Dairy Queens excluding mall locations. I recommend you call your local Dairy Queen ahead of time to confirm they ‘re participating. This event is supporting the Children’s Miracle Network. Consider making a donation when you get your free ice cream cone.